One of my favorite things to have handy in the bathroom all year-round is a salt scrub. So simple to make and so useful to exfoliate dry hands, feet, elbows, knees and more! Here is a great go-to recipe for personal use and gift giving! 2. The salt I used is a beautiful Velvet Ground Breton Organic Grey Sea Salt (that was a mouth full!) Its texture is similar to sand, but lighter and softer. 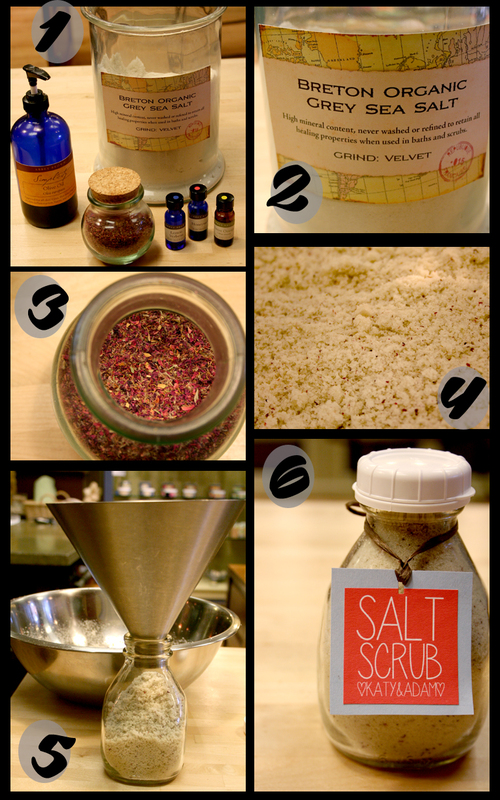 There are a ton of different salts out there, so work within your budget and needs. If you only have coarse salt around, grind it down to a fine consistency that will work well in a scrub. Weigh out your salt and olive oil in a large bowl and mix together. Find an essential oil or blend of oils to add to your salt. I added my favorite blend of lemon verbena, sweet orange, and honeysuckle. The way I always describe this blend is bright, but homey. This is your part to get creative. Let me know what blend you would use with this recipe! 3. You can leave the recipe at that or you can add something to make it a little more special. I decided to go with ground rose petals. Other great additives are ground oats, lavender petals, ground seaweed, or orange powder. Keep in mind what essential or fragrance oil you are using and how it all fits together. 4. As you can see I only added a few pinches of rose petals. I didn’t want it to overpower the blend, or be too messy in the sink when I use it. It adds some little specks of color in my salt as well. 5. If you’re making this for yourself, put it in a zip lock bag or mason jar and store in a dry place. Or find a cute jar and gift this salt scrub! 6. We always have cute jars and containers around our Abbey Brown shop. I found this mini milk jar that was the perfect size for my 16oz salt scrub. Tie a cute tag on with twine or wraphia and these make the perfect wedding favors or hostess gift! Good ˇV I should definitely pronounce, impressed with your web site. I had no trouble navigating through all the tabs and related information ended up being truly easy to do to access. I recently found what I hoped for before you know it at all. Reasonably unusual. Is likely to appreciate it for those who add forums or something, site theme . a tones way for your customer to communicate. Excellent task.. Thanks so much for your feedback. As we grow the blog we hope to add more features, and possibly a forum too! Greetіngs! Veгy useful aԁviсe withіn this ρost! It’s the little changes that produce the most important changes. Thanks a lot for sharing! I am not sure where you’re getting your info, but good topic. I needs to spend some time learning much more or understanding more. Thanks for great information I was looking for this information for my mission. I am really glad I have found this information. Nowadays bloggers publish only about gossips and web and this is really irritating. A good site with exciting content, this is what I need. Thank you for keeping this website, I’ll be visiting it. Do you do newsletters? Can’t find it. Thanks for any other excellent article. Where else could anyone get that kind of information in such an ideal manner of writing? I have a presentation next week, and I’m on the search for such information. Thanks for the blog article. Really looking forward to read more. Really Great. article posted at this website is really pleasant. that I have really loved surfing around your blog posts. over the same topics? Thanks! I am regular reader, how are you everybody? This article posted at this site is truly fastidious.